Acoustic Energy Active Pro 5.1 review | What Hi-Fi? Unlike most pricey subwoofer-satellite systems, Acoustic Energy's new Pro Sub Sat speaker package is utilitarian, straight-edged and plain. It's been designed for studio use first and foremost, where design fripperies come second to sonic requirements. But even so – you've really got to want this system in your room. Still: once you've heard it, there's every chance that want it you will. An active set-up, the Pro Sub Sat boasts wonderful accuracy, transparency and speed. Like its larger AE22 Active siblings (much loved here) its exceptional dynamics belie its modest proportions, ensuring a sound that teems with energy. Simply put, this is one of the finest £3000 speaker packages – of any type – you can buy. What makes it so special? First, its active design: there's 75W of power amplification inside each sealed-box ProSat enclosure, with 50W dedicated to the aluminium mid/bass driver and a further 25W to a distinctive ring-radiating tweeter. That confers huge performance advantages, not least because it entirely removes your surround amplifier's power (and relative quality) from the equation. 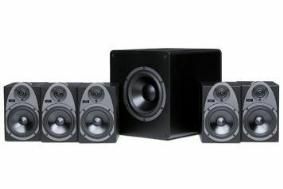 You will need multiple power points located around your living room, plus long RCA or XLR interconnects to hook up each speaker. And, of course, your amp or processor will need suitable audio outputs, too. The subwoofer is also active, with 200W driving its twin 25cm aluminium drivers. It includes both inputs and outputs for each channel; a simpler single-cable LFE connection is also included for standard AV outputs. And the sound? Spectacular. Brilliantly revealing of even the subtlest details, thunderously dynamic and amazingly articulate, even with the fastest and most complex multichannel rhythms. Our only gripe is that the ProSub seems a little out of step with the ProSats, sounding a little slower and less expressive – but to an extent that's only a reflection of the extraordinary agility of the speakers, which serves to highlight the sub's comparative lack of pace. This is a fabulous speaker package. It's not for everyone, but in sound per pound terms, it's incredibly hard to beat.